JerryRigEverything is back with another Pixel 3 XL video but this time focusing on the internal design rather than the external. As usual, he takes the phone apart piece by piece talking us through the whole process. We can see the Qi wireless charging on the back, the water damage indicators, all the adhesive used to stick the backplate and the battery in place as well as the duo of front-facing cameras. 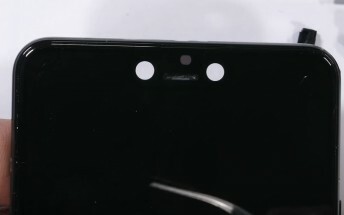 Speaking of which, looking at the size of those two sensors, it's pretty obvious that the notch couldn't have been much smaller. Jerry confirms what iFixit found the other day - the Pixel 3 XL is pretty hard to repair so make sure you take good care of it, or you might end up paying dearly.